Arrived two days ago in Madrid, to bring our Africa to FITUR. 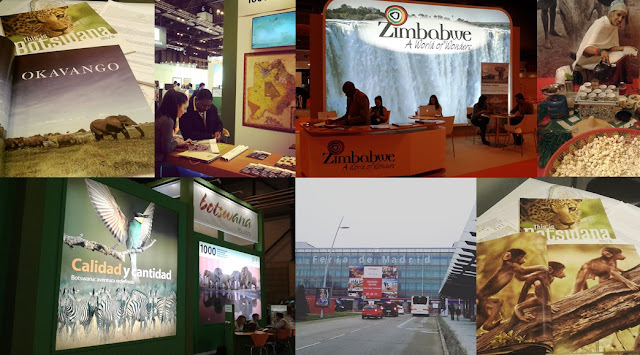 THE WORLD IN 8 PAVILLIONS, this year FITUR is hosting 165 countries, some of which are found in Africa’s section of Pavilion 6. 5 days to visit the most attractive destinations! You can speak to the professionals of this industry and get the most advantageous and interesting tips for your future trips. One of this year’s main theme is excellence and innovation emphasising on responsible tourism. In 2015, 1,185,000,000 international travellers were reported to have crossed borders, which is 50 million more than the previous year. Quite remarkable figures considering all the difficulties and tragedies the world has faced in the last year! We spoke to one of the Representatives from Botswana’s Tourism Organisation who told us that this year people seem to be very interested and excited to experience the Okavango Delta (UNESCO World Heritage Site) in mobile camps or choose "the real Botswana Camps" for that particular feeling of glam among the beauty of the country. Botswana has achieved very high standards in the last decade which also exceeds customers expectations. Distributing wonderfully finished photo books, reporting experiences of famous explorers some of which also work for the National Geographic, they are proposing the idea of ‘getting back to nature’. This country is very selective about the quality of tourism and they have laid down conservation policies and eco tourism strategies to ensure that the type of tourism that comes in is sustainable for both its inhabitants as well as the environment. With English as its official language (although a lot of local people speak Setswana), it is very easy for the traveller to communicate during their travels. We also spoke to Mr. Kutukwa, Marketing Executive from the Zimbabwe Tourism Authority who mentioned that this year the main concern of people querying about visiting Zimbabwe are about the long flights to get to Victoria Falls. People are asking about whether any airlines will be introducing any direct lines from European principal cities to Vic Falls. To this, he answered saying that there are discussions going on but nothing yet concrete. He mentioned that even though Zimbabwe is very famous for the breath-taking Victoria Falls, there is more than that to this country, and he really recommends a visit to the Hwange National Park, which is the largest national reserve in the country, though Zimbabwe hides very exclusive and full of emotion corners that have to be touched by expert travellers who love the feeling of Africa. He also suggests visits to the local village which enables the traveller to interact with the local people and get a taste of their culture. On walking away we were stopped by a beautiful lady dressed in a typical Ethiopian dress sitting in a corner roasting coffee in their traditional way. We took a sip and immediately we were overwhelmed by this warm Ethiopian infusion.